The first time I drank sake at a non-Japanese restaurant was nearly seven years ago at Coi, a Michelin-starred establishment in San Francisco that serves modern Californian cuisine. I had opted for the beverage-pairing course, and the drink came with a dish of tofu mousseline in a thickened mushroom broth laced with kelp and bonito flakes. The combination made perfect sense: the sake played off the Japanese-inspired ingredients in sensory and conceptual harmony. Since then, I’ve encountered sake in a variety of culinary contexts all over the world. The drink’s umami-enhancing properties make it a wonderfully flexible complement and forward-thinking sommeliers have been looking beyond its obvious suitability for Japanese flavors. The brew works just as well with the creative Spanish food at Bam, a gastrobar in Singapore, as it does at the Japanese-Peruvian restaurant Maido in Lima. Sake also brings out the best in a delicate dish of prawn tartare and caviar served in a chilled broth of winter melon at three-Michelin-starred Benu in San Francisco. Ironically, the concept of matching sake with non-Japanese cuisine has yet to take off in Japan, but things appear to be changing as Tokyo’s French restaurants follow in the footsteps of sake-pairing pioneers such as Narisawa and L’effervescence. Last year, Tirpse showcased sake in a yearlong series of lunch menus composed entirely of desserts. More recently, Florilege and Liberte a Table de Takeda have started including sake in their beverage pairings. JG Tokyo — New York-based chef Jean-Georges Vongerichten’s outpost in the Roppongi district — is the latest high-end Tokyo eatery to add sake to its drinks list. Last month, the restaurant began offering sake pairing courses (available for ¥5,000) to match its menu of Asian-inflected French cuisine. Executive chef Fumio Yonezawa came up with the idea after working with sake brewers for a special collaboration dinner earlier this year. 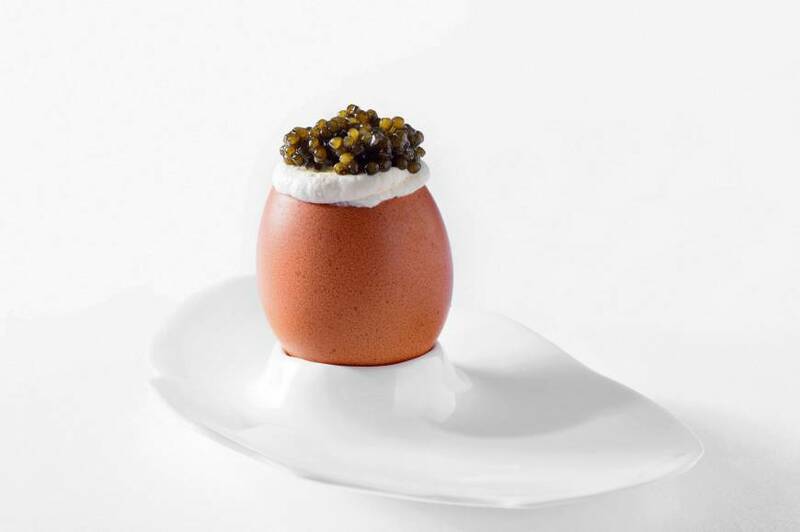 On a recent evening, the meal opened with a glass of Hakkaisan Kowakura Shikomi Daiginjo, paired with the restaurant’s signature Egg Toast, consisting of slow-poached egg yolks sandwiched between thin slices of brioche and topped with a mound of Osetra caviar. A dish this decadent calls for restraint, and the sake — crisp, poised and clean — delivers. The earthy, toasted-grain notes in the next drink, Shichihonyari Munouyaku Junmai Muu, balanced the complexity of the sea bream with maple-coated celery and pink pepper vinaigrette. However, the most successful match was also the most counterintuitive: a buttery lobster tail atop a jade pool of herb sauce, served with the gutsy Daigo no Shizuku from natural sake producer Terada Honke in Chiba Prefecture. The sake’s yogurt and citrus flavors highlighted the freshness of the herb sauce and the sweetness of the seafood. An appreciation of sake may be spreading globally but Yonezawa believes Japan is still “the best place in the world” to experience it paired with a meal. 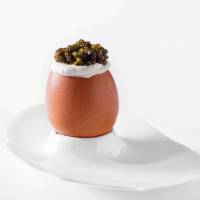 For more information, visit www.jean-georges-tokyo.jp.